I know. Bummer. An entire post devoted to salad. Not a BLT salad or a wedge of iceberg with thousand island dripping in and around the crevices. But a yawn-inducing, omega-3-rich, good-for-you, raw bowl of nutrients that falls into the “leafy green” category. Thanks, Jenny! Thanks for the big bowl of homework! But the real magic is a little more subtle. When you — as in you mom and dad! — get up from the table you’ll suddenly notice that the guilt you have been carrying around with you all day about missing “parent observation day” at tennis has been replaced by a rush of happiness endorphins. And you know how you’ve been beating yourself up over the fact that your eight-year-old still can’t tell time? For at least a few days after you have served your children this salad, that hardly seems to register on the guilt-o-meter either. The remorse over the fried-in-butter beef-veal-pork double hot dog with spicy curly fries from Walter’s*? Gone. Completely cancelled out. I’m telling you, this stuff is powerful. And, sadly, its applications of guilt-erasing possibilities: endless. The credit for this salad goes to my superhero friend Naria, who first made it for me for lunch last summer, then again last week at a delicious dinner party. Wash and trim the stems off two large handfuls of kale. Chop into confetti-like strands as shown. Shred a boatload of ricotta salata on top, add about 1 tablespoon of red onion that has been sliced to the point of transparency. Add a few glugs of olive oil, a squeeze of lemon, and freshly ground pepper. To feel really virtuous, serve with fish presents. Wow this is a heavy post. I don’t even get to cook the kale? You’re eating raw kale? This is asking a lot of your readers, Jenny. Even I am not sure this one will fly. Eeeyikes. I feel guilty even questioning this. Don’t question it. Just eat it! Kale is my very favorite green. Even my husband likes it! I will def try this – I make a Tuscan version w/Parm and bread crumbs – the longer it sits, the better it is. But ricotta salata rocks. love the Walter’s and MHS shoutout! Ummm…raw kale? Girl…What happened to the gal who rarely entered Garden in college, yet alone hung out at the salad bar…Whoa! So funny, yesterday morning, before I saw your post, I stopped at the store and bought some lacinata kale, planning to make this. I was so excited that I had thought of a way to eat dairy at the table without making my (newly allergic to dairy) son feel sad and marginalized. Because there in no way in a million years he would ever come near a bowl of raw kale. It was a dish that I could eat all by myself guilt free! LOL – such a good post I may just have to try this. Made it last night (b/c I had kale in the fridge and for a week did not know what to do with it!) and our 4 year old loved it. Our 2 year old did not. She’s got time. So good. So funny and so true! It is amazing how good it feels to see your kids eating a healthy meal. Just love that kale!!!! Love, love, love it!!! Thanks for our side dish tonight. Delish. I just made this for dinner tonight–I think it’s beyond the children, but I’ve sampled before serving and it’s so yummy. Serving it with the NYT chicken adobo and coconut milk rice. Yum. What is ricotta salata? Do you mean ricotta cheese? 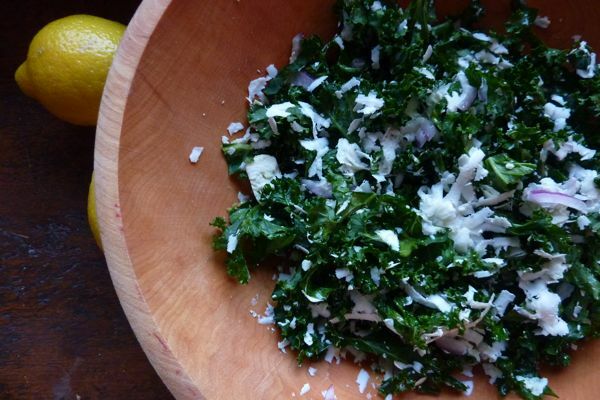 this recipe pushed me over the edge to a full-on kale salad obsession. A few ideas — I made it for a potluck and added some chopped, toasted walnuts and walnut oil, and it was unbelievable. One preparation tip is to massage the olive oil into the kale leaves — it softens them a bit and integrates the dressing with the salad. It’s also a bit therapeutic, like a healthier version of kneading bread. Next time, I’m going to skip the chopping and put the kale in the food processor to chop to a tabboule-like consistency. Come to think of it, kale tabboule would be fantastic! A friend of mine brought this to our house for a dinner party, and I COULDN’T STOP eating it. I like kale, but usually don’t love it — but I had to stop myself from sticking my fork directly in the salad bowl. SO good. Thank you for sharing! Kale was in our box from the food co-op today, so guess what’s for dinner? OK, this is becoming a once or twice a week dinner item! Thanks! I am missing something – what is ricotta salata, and where is the recipe for that? nancy – ricotta salata is a kind of cheese, it’s hard, very white, very salty, and shreds beautifully. You can find it at better supermarkets and Whole Foods. I made the kale salad with some chopped up strawberries and sunflower seeds….it was outstanding! Thanks for the recipe! I wanted to let you know that I featured this great recipe in my “What I Bookmarked This Week ” post – stop by and see! I just made this and it is sooo good! I have never eaten kale raw…only baked as kale chips. I massaged the olive oil and lemon juice into the leaves and let it sit for a bit. Added lots of the ricotta salata, and also some slivered almonds. Fantastic. Can’t believe I’m going back for more RAW KALE!!! Kale, lemon zest, lemon juice, olive oil, shallots, parmesan cheese. Best salad ever. Loving kale! I have been massaging mine right after the thin slicing step with a little celtic sea salt.. so that it turns greener, and a little softer.. then lime juice and olive oil.. sometimes simple tumeric and freshly ground pepper.. but the sky’s the limit.. I love your hard cheese and red onion suggestion! Thanks, just tried this. Gave a small bowl to my husband, and he merely commented on how edible it was, considering it had red onion in it. Didn’t bat an eyelid at the kale. Has anyone tried kale with pickles or hot jar peppers (stuff he likes)?